You can decorate your house with royal icing after you have glued it together, but with this set above, I decorated each piece and then glued together when all the cookies pieces were dried. I prefer to decorate each piece before gluing the house together to ensure my design is the way I want it, rather than run the risk of the RI dripping…unless it is the look you are going for. 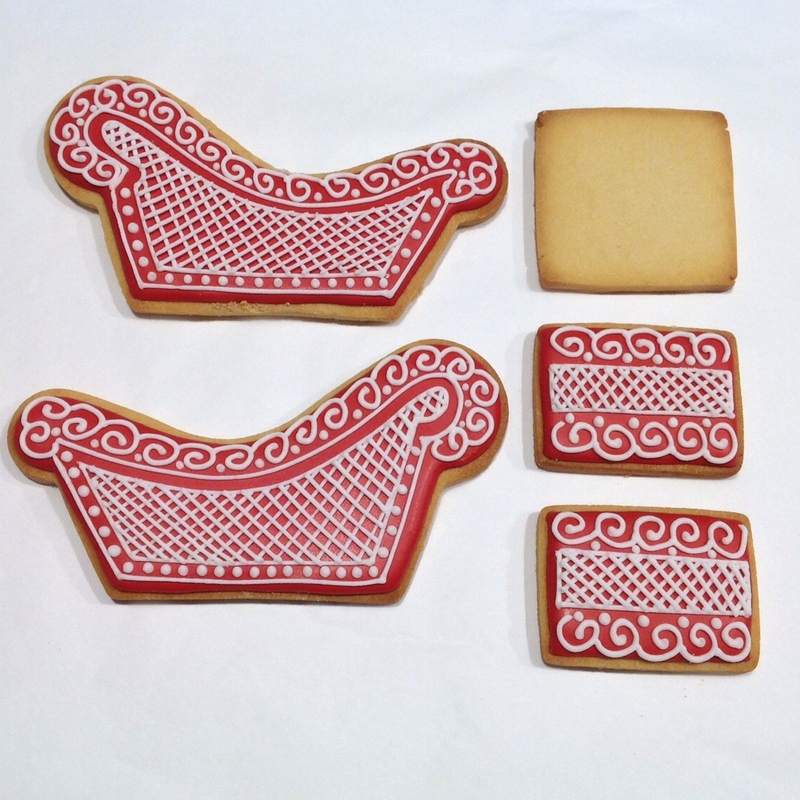 STEP 1 – Using your CutterCraft cookie cutter set, bake your favourite biscuit. You will need 2x fronts, 2x side sleighs and 1x base. VERY IMPORTANT – When you have cut your sleigh sides, flip one over so it is facing the other way. THis will ensure your sides match up and also gives you a smooth decorating surface. Generally, I make a cookie about 6mm thick, using our cookie dough rolling guides, but for extra thickness you can also use our 2mm rolling guides and roll your dough out to 8mm. Just ensure you alter your baking time to cookie right through. You can find a delicious gingerbread right her under ‘Recipes’. Once decorated and dried you are ready to start putting the sleight together making a fantastic centre piece. TIP – Whichever cookie dough I use, I always roll out my dough in between baking paper to my desired cookie thickness and RE-FRIDGERATE till cold. This eliminates me having to use extra muscles to roll out a cold, hard ball of dough. I then cut my shapes and FREEZE the shapes for a further 20 minutes. I then place directly into oven for the recommended baking time. I have a few trays going at once. Working with the cookie dough generally becomes soft and when placed unfrozen in the oven, you may notice they spread whilst baking. STEP 2 – Build you sleigh on some baking paper. Using royal icing (stiff consistency works best) Add a generous line of RI to the base of the sleigh sides ready for gluing it in place. STEP 3 – Glue one side to the sleigh base. (Resting on the bench top) Press firmly, but carefully so as not to break your cookie. Make sure you have aligned it properly to dry in place. Using a glass or something to hold it in place is very helpful. You can add as little or as much as you like. The more RI you use the more it will squeeze out of the edges. STEP 4 – Repeat with the other side of the sleigh. STEP 5 – Now add royal icing to the bottom and also the very sides of the front and back walls. (See picture) Carefully insert in between the sleigh sides. The sides will glue onto the sleigh and the bottom royal icing will glue onto the edge of the base. (Once again these pieces rest on the bench (not on top of the sleigh base). STEP 6 – Now your sleigh is complete. Once dry fill with your favourite lollies or Christmas cookies. TIP – Once it is semi dry slide over onto a clean baking paper part to ensure the extra squeezed out royal icing does not set hard and make it more difficult to move.